You guys, I sometimes wonder if my children do things just to taunt me. Like, for instance, when it’s the end of their first day back at school and I ask how it went. Their answer to everything is: “Okay”. (Insert manic eye twitch here) Okay? Just okay? Details!! I want details! Graphs! Illustrations! Just “okay” doesn’t cut it. Anyone feel me? When it comes to my kids schooling, I get very, very involved. Kyle is 16 and in Grade 11 this year and I still mark every pen and pencil, I cover every book myself (I know, don’t side eye me) and I make sure that the bag is packed. Did I mention that Kyle is 16 and in Grade 11? Fortunately, this year Crazi Erazi has been some sort of a distraction, because I can’t get enough of these mini sized pencil erasers. These bite sized erasers are the new collectible craze and to celebrate your child’s first day back at school (and all the madness that goes with it) we’re giving away three sets of Crazi Erazis on the blog! Yay! 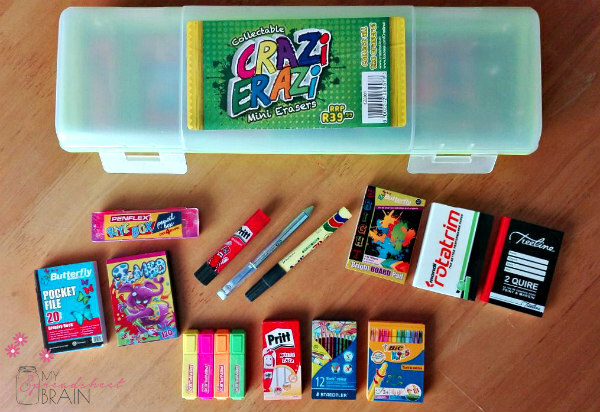 So Crazi Erazi is a new mini collectable series, featuring some of South Africa’s best loved stationery products. That’s right, there’s a mini Pritt, a mini 2 quire hardcover book and even a mini Mondi ream of paper. Aack! Too much for my heart to handle! How cute is this? The full Crazi Erazi collection consists of 13 erasers (and yes, they really do work). The erasers can be purchased at a variety of participating retailers and stationers for only R6.99 each. There’s a really cute plastic collector box (which your kid can use as a pencil case) which retails at R39.99. I like that each eraser is packaged in a foil bag… gives it that extra hint of excitement, before your kid rips it open. This is also a really cool campaign to encourage children to meet up with friends to swop and compare collections. Did I mention that these mini’s are super duper cute?! Because they so are! The campaign runs until end of January and you can pick your erasers up at one of the following participating stores: Shoprite, Pick n Pay, Game, Makro, CNA, West Pack Lifestyle, Office National, Inovocom and select independent stationers. What do you think about the Crazi Erazi collection? Win a Crazi Erazi set for your little one! Crazi Erazi is giving away THREE eraser sets to THREE fabulous My Spreadsheet Brain readers! Whoop whoop! To enter simply follow these prompts below. Winners announced next week. Make sure to check out my Facebook page to see if you’re one of them! This is so cool love it as much as my daughter does.